Morpeth Town are gearing themselves up for the biggest day in their history when they face Hereford in the FA Vase Final at Wembley on Sunday. More than 45,000 tickets have already been sold for the day, which also includes the FA Trophy Final between Grimsby and Halifax. The Morpeth-Hereford game kicks off at 12.15pm, with Grimsby-Halifax at 4.15pm. Morpeth have sold just over 4,000 tickets for the game, but their fans will be outnumbered five-to-one by Hereford, who have sold more than 20,000. Morpeth will travel on Friday morning, stopping for a training session at Nottingham Forest, before going on to their base at Watford, where they will have a light training session on Saturday morning. On Saturday afternoon they will go into London to meet up with some of the Morpeth fans who are making their way down to the capital for the game. On the team front, midfielder Maty Halmbiec and defender Dickie Hiftle will both miss the Final with knee ligament damage. Both will be out for at least 10 weeks. Other injury concerns lie with Shaun Henderson ( thigh strain) and James Novak (knee). The injuries to Henderson and Novak will be assessed at the training grounds of Sunderland FC later in the week when the club attend training sessions at the Premiership outfits’ facilities. Tickets for the match are still available either through the FA website or through Morpeth Town FC (contact John Richardson on 07738 447544 ) . Morpeth chairman Ken Beattie said: “This is the biggest game in Morpeth Town’s long 132 year history and I think it is now sinking in as to the magnitude of the match with everyone associated with the club. 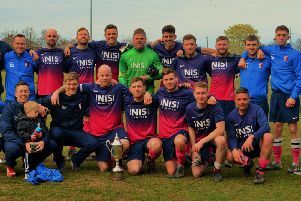 “We are preparing to play in front of the biggest FA Vase crowd since the competition’s conception and for the first time the match will be covered live on TV beaming worldwide. More build-up on page 39.